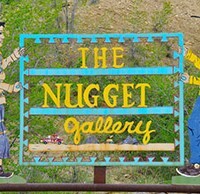 Nugget Gallery, located at 1302 S. 2nd St., was hit by burglars over the Labor Day weekend, who made off with a treasure trove of jewels and antique cash, reportedly worth thousands of dollars. The culprits cut through the back fencing and broke-in on the south side of the building. Instead of going through a door or window, they chose to pry open exterior metal slats, chiseling their way through the drywall into the establishment. 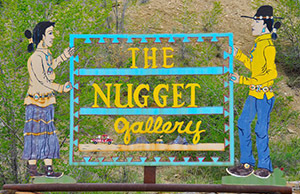 Owner Steve Coleman gathered there were at least two thieves, given the precision of the operation, which he claims were selective in picking the jewelry of key artists from the gallery’s upscale collection. He discovered the theft on the morning of Sept. 8, after returning to work from a three-day weekend that he and his wife decided to spend out of town. To add to his woes, he said that none of his extensive collection is covered under an insurance policy. However, he does have insurance on the structure. Coleman estimates that thieves made off with $250,000-$300,0000 worth of fine Native American jewelry, silver certificate bills, Morgan and Liberty silver dollars, and more. He said one concho belt stolen was alone worth about $25,000. Gallup Police Department Capt. Rick White said they are waiting for a list of stolen items from Coleman to officially record the value of the items taken. White also said there was “forensic evidence” left at the scene, which was collected and sent to the Forensic Laboratory Bureau in Santa Fe for processing. Coleman asked for consumers and local traders to be on the lookout for individuals selling jewelry designed by Tanya Rafael, Nelvin Burbank or Stewart Billy. He said all three artists typically stamp the inside or backside of their pieces. Burbank, he said, uses “NB” and Billy “SB.” Rafael spells out her name, or at least on the brooch he showed the Gallup Sun. The culprits were also careful not to break the jewelry cases, even picking the lock on one glass case instead of smashing the glass and taking the contents. He also said the savvy thieves cut the power, which likely prohibited the alarm system from going off. “Because it was cut … it didn’t go to the police or alarm company,” he said. Coleman also said Tuesday that his business phone line was down, but he wasn’t clear if thieves cut the actual line. Coleman is offering a $10,000 reward for the capture and arrest of the culprits and can be reached at (505) 862-4381. White said anyone with information on the break-in is encouraged to call Crime Stoppers at (505) 722-6161.